This is one in a series of posts on the Nikon Z7. You should be able to find all the posts about that camera in the Category List on the right sidebar, below the Articles widget. There’s a drop-down menu there that you can use to get to all the posts in this series; just look for “Nikon Z6/7”. 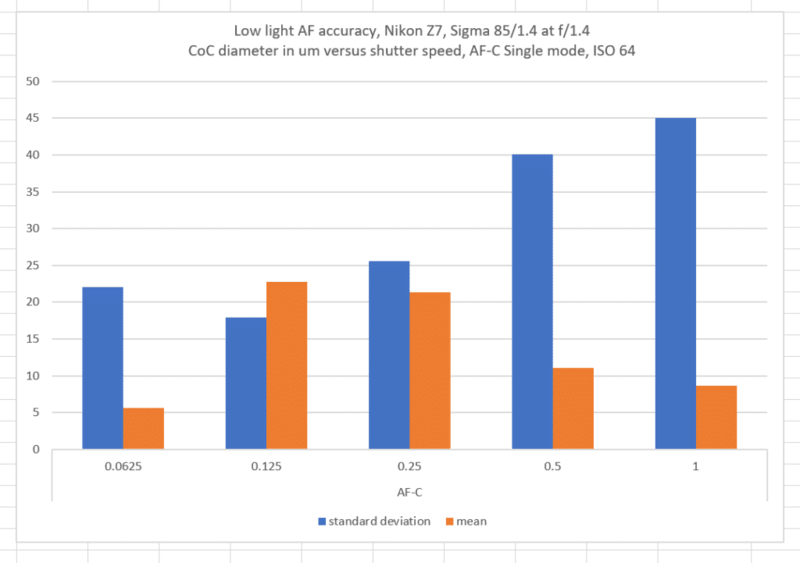 A few days ago I looked at the Z7’s autofocus accuracy in moderately-bright light with the Nikon 105 mm f/1.4 lens. 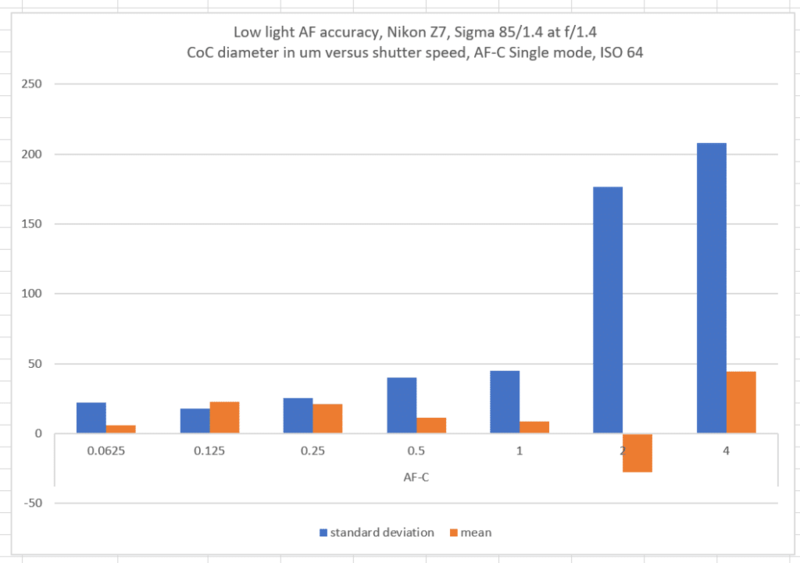 Today I’m going to see how the AF accuracy drops off as the light dims. I mounted a Sigma 85 mm f/1.4 F-mount ART lens to the FTZ adapter, and attached the adapter to the Z7. I opened the lens up all the way and threaded a variable neutral-density filter on the front. I turned the filter to minimum, set the ISO to 64, and made a series of 16 exposures. Then I added a stop more density to the filter, doubled the exposure, and made another set of exposures. I kept doing that until the camera failed to focus. The shutter speeds are in seconds. The first set of data is for 1/15 second, and the mean of that series is used as the reference. There is a slight amount of back focus at 1/8, and the standard deviation starts to climb. By 1 second, the CoC of the mean error is about that of a standard depth of field table. By 2 seconds, the scatter, as evidenced by the standard deviation is quite high. 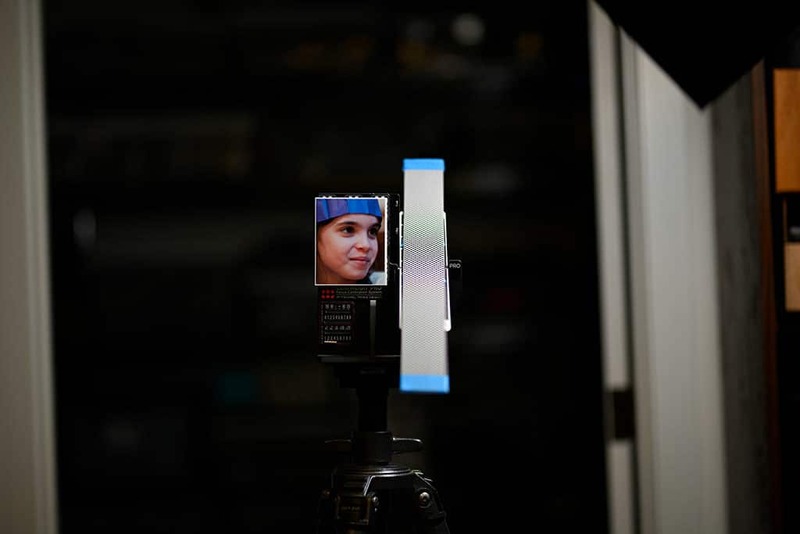 At 4 seconds, the camera won’t focus at all most of the time. These were done at base ISO. 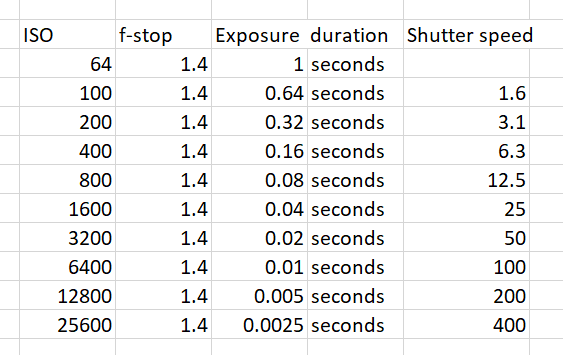 To get an idea of what exposures with that much light would be at higher ISO’s I made a couple of tables. 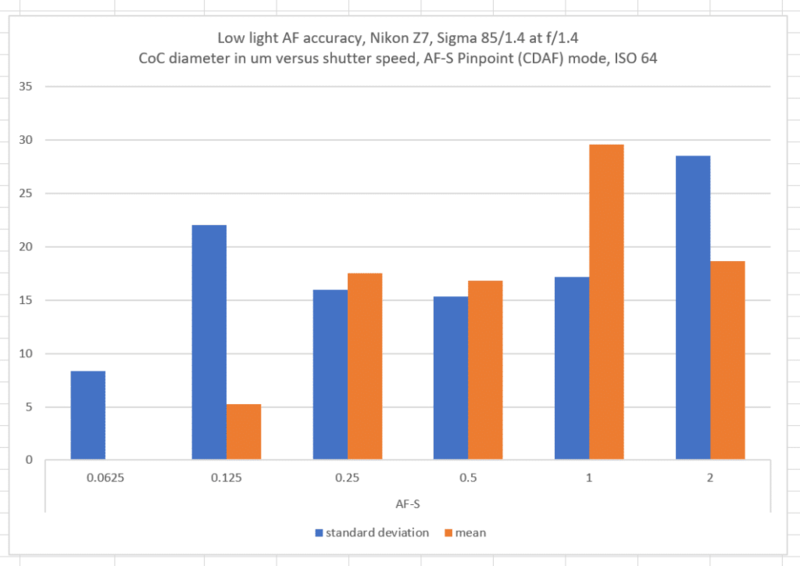 the first one corresponds to the case where the light is beginning to very seriously affect the accuracy, and the second to the point where the autofocusing is approaching uselessness. I next set the camera up for AF-C with release priority and Single spot size. The scatter is quite high at 1/2 second and one second, though the mean is good. Here is a sample capture processed with the default settings in Adobe Camera Raw. 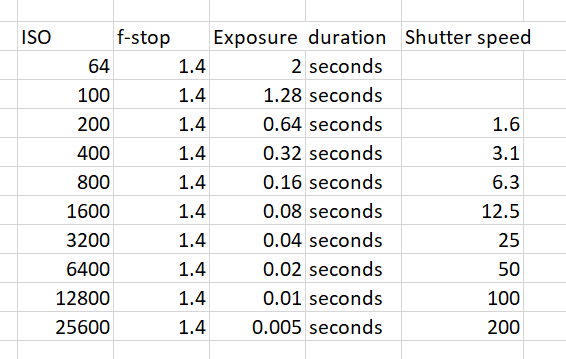 The image is somewhat underexposed in the focusing target area so that the ramp would be correctly exposed for automatic processing, so you might consider the above numbers to be slightly optimistic for more conventional exposures.